Cameron tries to “McCrone Report”evidence of vast new oil field in Scottish waters. 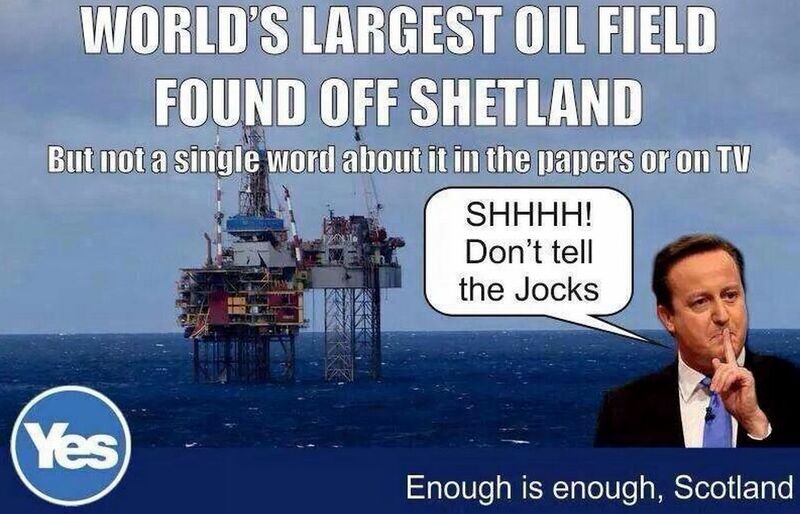 News of “World’s largest oil field” discovered in Scottish waters is being suppressed till Sept 19, claim. £2.5 TRILLION of Scotland’s wealth said to be at stake as Cameron seeks to suppress news of vast new oil reserves until after the referendum. Cameron goes to Shetland and offers us £46 per year, while he’s reportedly busy conspiring to steal £2.5 TRILLION from the Scottish people. Of course, this theft of £2.5 TRILLION of Scotland’s wealth has been condemned by precisely zero Unionists and NO leader of Better Together. The term “anti-Scottish” loses all meaning when those responsible for theft of £2.5 TRILLION of Scotland’s treasure are lauded by BT. 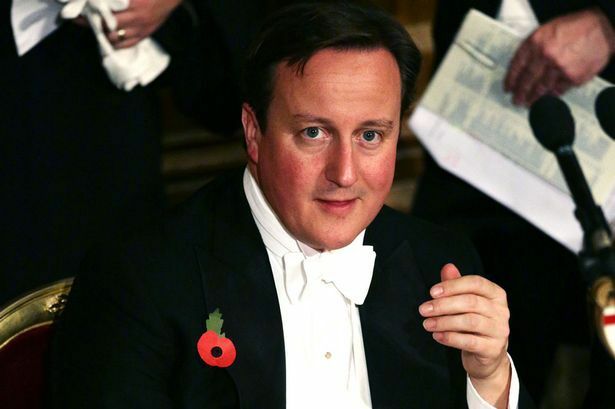 Cameron’s Grand Larceny demands a response. Where’s the procurator fiscal when you need him? We are indeed a generous people when more than half of us (Polls say) want to gift a Tory millionaire PM £2.5 TRILLION of our money. That’s ~half a million pounds for every man woman and child in the nation. The bubble of NO just burst. Make no mistake, the choice we face on 18 Sept now includes, YES to £2.5 TRILLION or NO to that money, NO to free bus passes, NO to free prescriptions, NO to free university education, and NO to free homecare for the elderly. Many of our people live in poverty. It would be criminal to deny them the remedy within our grasp. Mr Cameron came to Shetland to say absolutely nothing about anything and allowed the local media 6 minutes of questions. 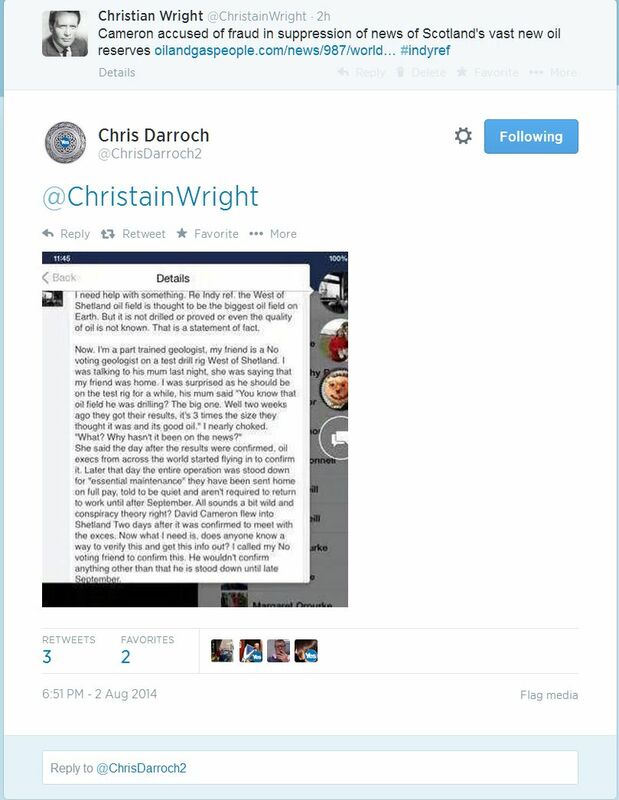 … Which he did not answer. As luck would have it, Buster was flying his drone around the West of Shetland oilfields recently when he noticed something strange. A drilling rig, definitely not on contract to BP, and not near the Clair Field did not suddenly de-man and send all the workers home and they are not on full pay. The rig did not discover “sweet oil”, the most highly-prized stuff for turning into petroleum spirit, nor was it in shallower water than the normal 150m some of the other Clair oil is lurking at. Nor did it find it in quantities so large that “biggest” and “world” could be used in the same sentence. “He would never do that. Just like Westminster didn’t before the last referendum. We’re sorry we have absolutely no news for you about the vast oil and gas reserves not found in the Atlantic but when we do hear anything you’ll be the first to know. Now, as for all this Oil you think will be stolen from you… there’s no doubt thats what they are trying to do but it really doesn’t matter. That 2.5 trillion wont leave the oil companies bank account. regardless of which government ends up with the oil…none of us will actually see any of it. The rich will stay rich. To be fair, id be more worried about an oil spill on the coast of my own country more than id be worried about having money taken off me id never of seen anyway. If questioned, on Tuesday, by Alex Salmond on this subject, Darling can say “I know nothing”. After all he is only a mere Back Bench MP,not even in the Government. But I bet he knows the history of McCrone, et al! Familiar ring to the news,just as the lies were familiar about not being able to “manage” our economy.The big question is how many people have been convinced that they are too poor and too wee? then too stupid? The dishonesty of the printed media in Scotland and the BBC has went to far this time.Will we be once again ripped off because of the liars in government(Westminster mainly) and the compliance and greed of the unionist parties at Holyrood?The blood stirs and the anger rises,not with the easily lied too,but with the liars themselves.